Last night when I got home, I discovered that Parliament were debating “Council Tax Limitation – Lincolnshire police authority budget”. 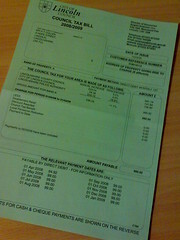 The bill was to place a cap on the 78.9% increase that Lincolnshire police authority had made on the council tax bills. I blogged about this in March (Council Tax up by 11.1%). So how did those Lincolnshire MPs vote? Out of the 7 Lincolnshire MPs with consituents affected, only one went down the lobby. However, at least unlike 44 LibDems, the Tories didn’t actually vote against it. artesea disapointed to see the LibDems voting no on the Lincolnshire Police Council Tax cap on BBC Parliament. joswinson is voting against the unfair Council Tax system. However I still can’t see how a “Local Income Tax” would have stopped the Lincolnshire Police from asking for more money than anyone would expect. Instead we now have it on record that the LibDems are “pro” 78.9% increase. Maybe someone from the Parlimentary party would have like to have asked those who have been affected by the issue, and campaigned in elections last May what our views were first, or is that just a bit too hard?